How do you accumulate the 2000 points? Use this Points Chart for reference. NOTE: points count ONLY from your own orders and from personally sponsored team members (ie. “front-line”), not from other Reps on their teams. Start with your own family’s orders. 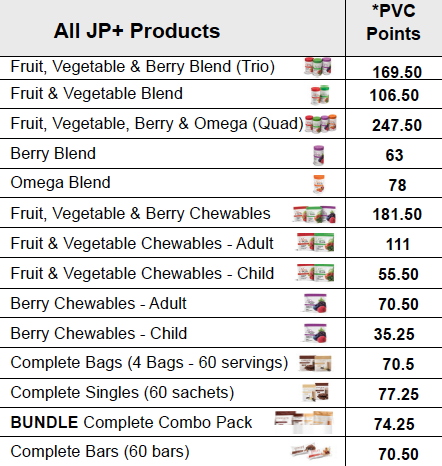 Your customers will buy the Juice Plus+ products that you use and love. If you don’t grow a Tower Garden, they won’t. If you don’t use the Vineyard, Complete and Omega, they won’t either. It’s that simple! Note: by following this approach, the $100 HLP bonus you earn (plus your first month ‘profit’ on your products and your customers’) should cover the cost of your Juice Plus+ products during your first 2 months, at least. How do most people complete their 2000+ Fast Track? 2. Getting one team member (or more), who does the same – 500 points. 3. Together with their new team member(s), taking orders from 3 other households to total 1000 points. If you find 2 or 3 team members instead of one, then you move even faster: 4 x 500 = 2000 points! All orders, including your own, must be Preferred Customer orders to count towards your Fast Track bonus. Your new Rep must have at least one active preferred customer order on his/her account. All of your personally sponsored team members (ie. “front-line”) Rep(s)’s personal and customer orders contribute to your 2000 points for the $300 bonus and VF promotion.